SynSysCo rebuilds Leybold SCROLLVAC SC Scroll pumps as well as Ulvac DIS, Varian DS, and Edwards GVSP and ESDP scroll pumps. All of these pumps are manufactured by Anest Iwata. 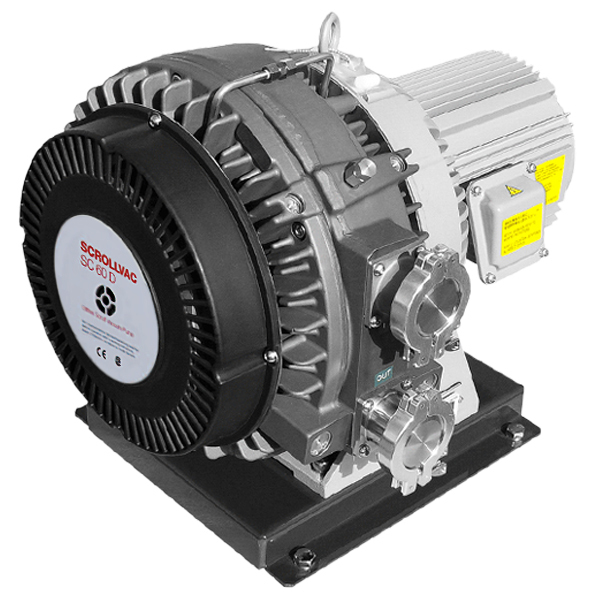 SynSysCo is the largest, most-experienced distributor of Anest Iwata Scroll Meister dry pumps. In 1998, we executed the original agreement to bring the Anest Iwata brand to the U.S. Our experience enables us to provide the best warranty on new and rebuilt Anest Iwata pumps and private-labeled versions of these pumps. Anest Iwata manufactures a variety of scroll pump models that are globally marketed by several firms under their own names. SynSysCo is an authorized rebuild center for all Anest Iwata manufactured scroll pumps, and as such, can rebuild all of the listed models. You can trust SynSysCo to provide the best scroll pump repair services. Our rebuild warranty is for 24 months or 11,000 running hours, whichever occurs first. Parts are inspected against OEM factory part tolerances and replaced as needed. processes and calibrated and NIST traceable vacuum measurement equipment. Turnaround time is typically 3-5 working days after receipt of the pump at our facility. We supply custom packaging that enables the user to send in the pumping module and not have to ship the motor. This saves shipping costs, protects the module from damage, and simplifies package and logistics.